so i saw this old canon film camera. does anybody know the model? Not that I'm an expert on the matter, but I've never seen that logo. Might be a knock off? I owned two Canon F-1 cameras. That's no F-1. I might think that was a limited production camera made specially for the Japan market, except that the logo is unofficial and I don't believe for a moment Canon Inc would have made a temporary one-off change to their logo. So I have to go with some kind of knockoff. I only mentioned do to the photo showing a "motor drive system"
Notice, please, that the picture of the camera you linked does not look like the OP's pictures. I had the motor drive, too. The MF model, packed with ten AA batteries. At the very least, you can google the history of Canon logos. Thats not a Canon logo. Again..........respect​fully, I only mentioned it because it has "motor drive system"
I still have these and they still work just fine and yes that OP is no F-1. Sold the motor drives decades ago. 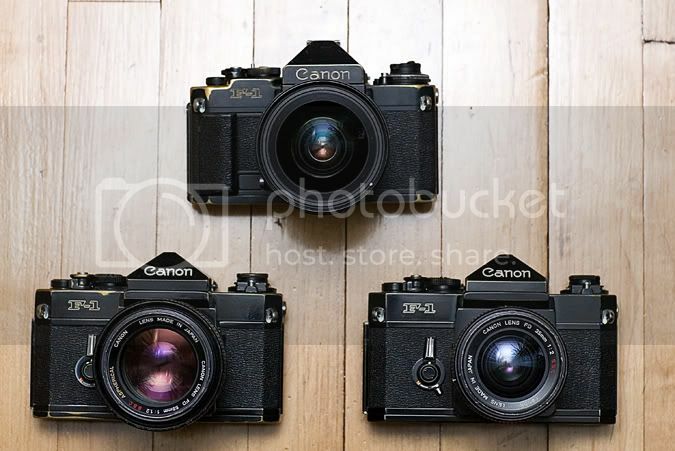 Ko, some of those old Canon rangefinders that are shown on the link you posted are pretty sweet.